I remember when we decided to start our first child on solids. Like most French people, we decided to start with carrots, not with hot cereals. I don't have anything against hot cereals (I actually like oatmeal with warm milk (yes, yes)!!) but I think that they taste too bland to me to be introduced first, especially if the child has been/is being breastfed. The whole point of starting a child on solids is to make her discover new stronger tastes and textures early on. Offering rice or oatmeal cereals does not serve that purpose well to my opinion. So, for my child, I made my first carrots puree and watched out as she took her first bite... It was the first time we were introducing the spoon as well, so there was some adaptation to the new utensil too. Needless to say that it was not a great success! I'm not sure how much she actually ate (maybe three full spoons? ); her whole bib (and our walls) turned orange....... but at least we had started the process! And as her mom, it was also a big step for me to see her take that first bite. I was emotionally moved (sigh)! Over the following weeks, I made a point to make my own purees with fresh vegetables, relying on baby jars when it was not convenient for me to bring my home-made food or when I needed specific vegetables (there was no way I was going to make peas or green beans purees!) I tried, as much as possible, to serve her green vegetables every other day, using more and more diverse vegetables and herbs (turnips, leeks, fresh thyme, parsley, etc.) as she was eating better. 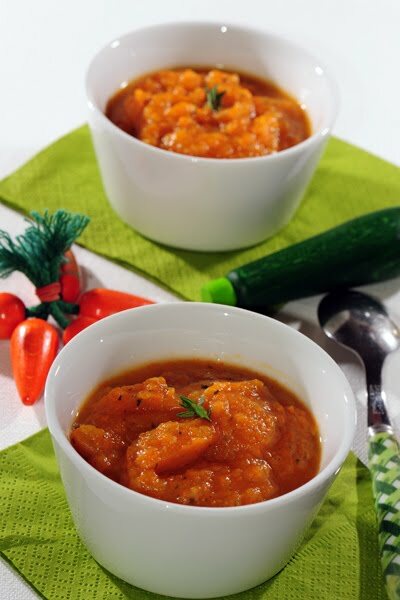 I would offer my child a vegetable puree for lunch and then, a few weeks later, once the salty taste was acquired, a fruit puree for her 4-pm snack. With the fruit purees, I found it easier to purchase the baby jars than making my own. As long they were not with added sugar, I was fine with the fruit jars. I did give her cooked apples when she was able to chew a little bit; I never gave her fresh fruits until she was one, except maybe for bananas. Once she was not having any difficulties with the vegetables and fruits purees, I started adding the hot cereals (plain first and then with vegetables puree.) I'm not sure she needed them but it made me feel like she was having more "solids"... and maybe, just maybe, having a fuller stomach, would make her sleep through the night better. I wished! A few months later, I was traveling to France and there I discovered the variety of baby jars available: no sweet potatoes (not very common in France), but zucchinis, artichoke, ratatouille (yes, ratatouille! ), leeks, etc. That gave me more ideas to prepare some home-made purees. I'll try to recreate some for you on this blog. In the meantime, here is the simplest ever: carrots with zucchinis. Bon Appétit! I have a vegetables mill that I use to make purees. I used it to make my child's purees; I find that without liquid, my immersion blender or stand-alone blender were not doing a great job. You can freeze the extra (ice cube trays are great!) so that you have it for another day or to mix with other vegetables. I never added salt. See my previous post on Sodium. super! merci sister car je dois commencer a donner des solides a Elias le mois prochain. Au fait j ai fait mon thanksgiving diner hier dans un restau mexicain (bon il ne faut pas chercher a comprendre c est Shanghai). C etait tres bon (repas traditionnel) mais nous etions les derniers a diner a 20h30 car la majorite des clients etait arrivee vers 17h (il manquait- merci bien- la TV avec le football americain!). A quand la recette de la dinde?? ?